Pain Patchs (also known as fentanyl, fentanil, Sublimaze, Actiq, Durogesic, Duragesic, Fentora, Matrifen, Haldid, Onsolis, Instanyl, Abstral and) Lazanda) are being used more frequently to treat patients suffering from chronic pain. This drug is 100 times more potent than morphine and is extremely dangerous. In many other cases, fentanyl is used to commit suicide where a user simply places the fentanyl patches in their mouth or apply more than one patch. Misuse is relatively easy for a County Coroners or medical examiner to determine death from overuse. However, in some cases, death from fentanyl results from being improperly prescribed to a patient with other health problems, taking other medications or treatment that result in side effects and complications leading to death. In other cases where suicide or malfeasance is ruled out, it is important to preserve the pain patch and container involved for analysis by experts to determine if the patch was defective or damaged prior to use. Incredibly, in some cases of accidental deaths, Coroners will immediately confiscate all remaining/unused Fentanyl pain patches found at the scene and will destroy the patches since they are considered controlled substances. Without further testing, it is impossible to determine whether there was any defect in the patch. So, if a family has a loved one who has unexpectedly died from an accidental fentanyl pain patch overdoes, they should immediately demand that the Coroner, the hospital or medical examiner preserve as evidence all used and unused patches at the scene. The family should immediate contact a fentanyl pain patch attorney to help preserve the evidence for further testing by competent technicians and experts who know what to look for. The ordinary act of walking along or across any street, roadway or parking lot is a common activity that can be extraordinarily dangerous. Whenever a pedestrian is struck by a motor vehicle, it is more often than not, catastrophic for the pedestrian. Of course, when a pedestrian chooses to walk along a public street in areas not intended or designed for pedestrian traffic, the pedestrian may be assuming the risk of injury to no fault of a driver. On the other hand, driver inattention is a major cause of pedestrian injuries when an accident takes place in neighborhoods, along cross walks, sidewalks and in parking lots. Driver error is often a main factor caused by the driver focusing on other vehicles, waiting impatiently for lights to change, proceeding before an intersection is clear or from distractions from cell phones, radios and text messages. When you or a family member is injured in a pedestrian accident while walking lawfully on a crosswalk, sidewalk or parking lot, contact attorneys experienced in pedestrian personal injury litigation to make sure your case is properly handled and your legal rights protected. 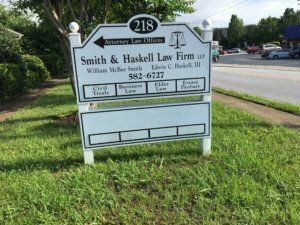 Call Smith & Haskell Law Firm LLP at (864) 582-6727.